The Sámi are the indigenous people of Northern Scandinavia and were in Paris with other indigenous to fight for climate justice. Ragnhild Freng Dale explains. 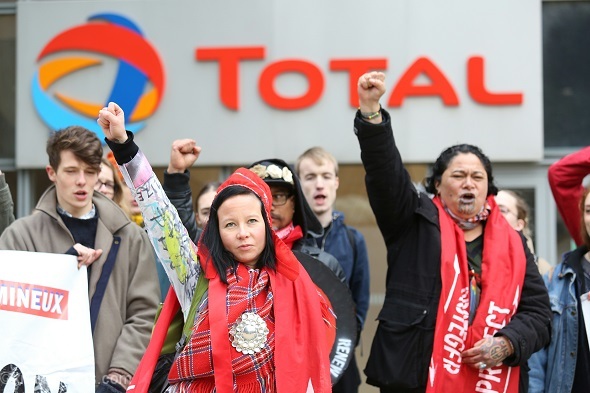 Jenni Laity, a Sámi women from Scandinavia, protesting in solidarity with other Indigenous people outside Total headquarters against tar sands and oil extraction. It’s half past noon in Paris, December 10. A small group of indigenous peoples from Sápmi and the Pacific Islands, with supporters from across the world, are standing in a circle in front of Notre Dame. The Pacific Islanders bid everyone welcome and start a ceremony where they receive a stone from the Arctic Ocean, which has been carried from Sápmi to Paris by runners in the longest performance and relay race leading up to the negotiations. Song penetrates the silence hanging over Paris’ protest ban, but the police make no move to interfere. They understand that this moment is far too significant to interrupt. The ceremony also marks the beginning for the Sámi grassroots movement’s stay in Paris. Sarakka Gaup is one of them. She explains that Sámi grassroots is a loose group of about 30 people, of which 10 have come to Paris now. The group first got together this autumn for a training in Jokkmokk, and marched at the frontline in London on 29 November. Sara Marielle Gaup Beaska’s joik, Gulahallat eatnamiin, we speak earth, has gone viral across social media. Sámi Grassroots has people from many sides of the borders, and are their own schedule alongside the COP21 negotiations. Their activities do not take place in the conference facilities, but through linking up with other indigenous groups and making their own ceremonies, spaces and actions. The Sámi are the indigenous people of Northern Scandinavia, and their land, Sápmi, stretches across the territories of Northern Norway, Sweden, Finland and Russia. The living conditions in the Arctic are drastically changing, and whilst the rest of the world has experienced a 0.85 degrees temperature rise, it is already up to 1.5 in the Arctic, with dramatic consequences. Reindeer herding, already under pressure from extractive industries and other regulations on the land, is becoming ever harder as the weather turns unpredictable. Where reindeer could dig through the snow to get to the lichen before, there is often a layer of ice which means they either starve or depend on fodder to survive through the winter. Sarakka’s family are herders, and she feels the change strongly. She, and others, are using their time in Paris to highlight how climate change is already affecting their lives. Ragnhild Marit Sara is a lawyer who works on cases involving indigenous people and extractive industries. She explains that many grassroots groups feel the decisions at the COP21 are taken ‘over their heads’. In Sweden, the Sámi were not allowed to be part of the delegation with access to negotiations, and in Finland the situation is similar. Neither of the two countries have ratified the ILO169 Convention on the Rights of Indigenous Peoples, and Sámi society is still fighting to be recognised. Norway has, at least up till now, had a good reputation when it comes to indigenous matters. She explains that the Sámi delegation from Norway were shut out of negotiations when the wording on indigenous peoples was removed. When they gained access again, it was too late to do anything about the change. Whilst the first draft contained many references to indigenous peoples, these have almost all been removed now. If the deal fails to recognise their rights in the operational part of the agreement, the danger is it becomes empty words which are not legally binding. During the COP21, the Norwegian Directorate of the Environment has also approved the dumping of mining waste in a fjord in Finnmark, Repparfjorden. Whilst the CEO of the company, Nussir, claims this will be harmless to the fish and life in the fjord outside of the dumping area, the Coastal Sámi and other people who use the fjord for fishing strongly disagree. The mine will also disturb significant grazing land for one of the reindeer herding districts who have used the mountain for generations. For them, it will be impossible to co-exist if the mine goes ahead as planned, and the Sámi Parliament is one of many actors who believe a courtcase might be underway from one or more of the interested parties. But whilst indigenous peoples are at risk of being cut out of the final agreement, they have not remained silent during negotiations. From the Pacific Islands to First Nations and – naturally – the Sámi, protests have taken place both inside and outside the meetings, including a sit-in to demand 1.5 degrees as the absolute max, rather than the old version of 2 degrees, which will mean the end of many island nations across the world. Sarakka says many groups have opted out of the COP spaces and are making their own spaces on their own terms instead.